How it will appear once completed. Following the launch of a campaign by the Advertiser last week, political momentum to secure funds for the Solas Picture Palace on Lower Merchants Road is gaining pace, with Galway TDs and senators meeting Environment Minister Phil Hogan yesterday. On Wednesday, Galway’s nine TDs and three senators met with Minister Hogan to lobby him to release funds held by his Department, worth more than €2.1 million, which have been earmarked for the arthouse cinema. 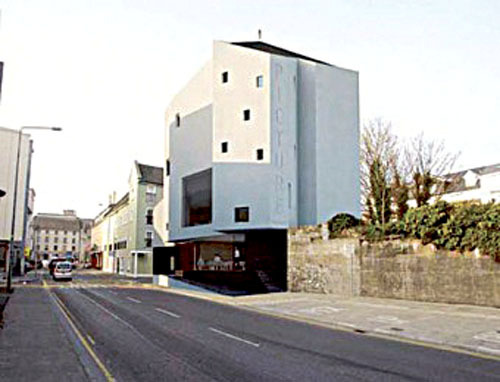 It is understood the Department will not release these funds until the group behind the cinema, Solas Picture Palace Teoranta, can raise €1.1 million itself to cover a shortfall arising from delays with the original construction work, and the need to appoint a new contractor after the original contractor went into liquidation. It is understood that at Wednesday’s meeting, Minister Hogan said he would “look seriously” at a proposal regarding some form of rating of derelict buildings, as a way of raising funds for local authorities. This would then enable an authority, like the Galway City Council, to put some of the money generated from this, towards the funding of the cinema. Such a move would require legislative change, but the Local Government Bill is due by early 2013 and may feature in that. Solas too has acknowledged the support from politicians and the businesses community.